Perhaps I can find a steady income somewhere at some point. I’m just tickled right now at how many minds are collectively realizing what a boon this was for exp food. Very well might stay the same. Because there’s going to be people who stop using them. Like the ones who would now need to buy 5 pies to get what 1 pie used to do. Don’t see how they would want to spend 1750c now to get what 350c got them. I do wish the Exo worlds had more resources. They are very pricey to warp to (which is fine if the reward is worth the cost). I couldn’t warp to most because the cost was 3000+ coins. Seems that there is a chance they may have natural resources with colors that we don’t currently have access to, and the three new ores, but not very much of them. I know the ores are suppose to be rare though. 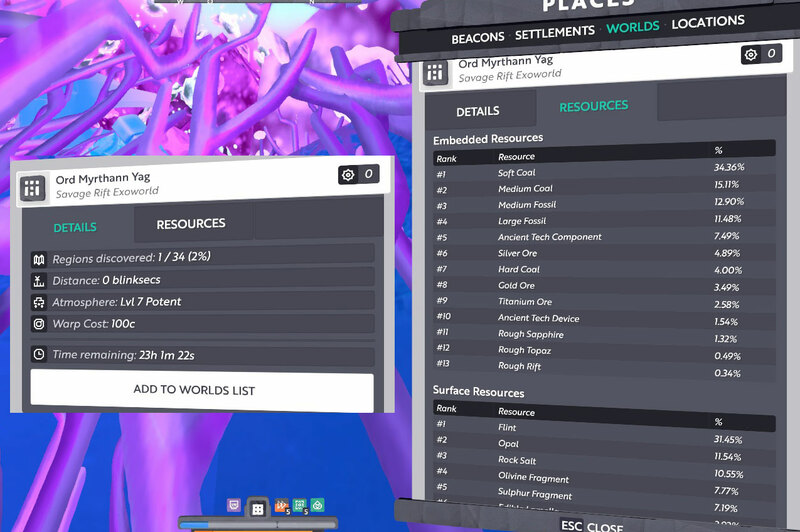 Well… the resource tab doesn’t say anything at all about the density per meter of resources, it just gives a breakdown of the ratio of resources. All planets resource totals add up to about 100% (99.97% in this case) so you cant measure the resource density from this tab alone. Looking at an Atlas gives a better insight of actual resource density with its color scales. My estimates put exo planets at roughly 150% of a t6 world. Ah ok. Thank you for the explanation. I punched a few holes to bedrock and came up empty & then logged off the server. Didn’t grab an atlas. I noticed in the sky a lvl 6 Coal world …the possibilities! I know that the teaching foods are really off topic, but that is a important part of playing the game. For many who do cooking, the piers are too expensive to make, for me getting the ingredients are a bit much, one pie needs 16 sweet beans and you need purified butter, which takes a long time to make (I think, it has been a while, too busy getting the stone to level up my alts). I do make the loafs, puddings and porridges, but they give much less of the xp, pies are 100%, loaf is 50%, pudding is 20% and porridge is 10%. I’ve never sold my teaching food as I give it to the guild I am part of, but I may start to sell some, the bread doesn’t need the butter besides using less sweet beans. Man, I was really hoping for a new, blue topic today. My guess, releasing on Wednesday or Thursday! I hope so. My gatherer needs exp. Lol. Just saw the new updates and I have to say that I think the Devs did a good job listening to player feedback and compromising well. Thank you Devs! Holy yyyyy sheiiist this is what I’ve been waiting for! Updated OP with details of Testing 218.2. Exoworlds set up new potentials that would not have been compatible in the permanent worlds. Sounds like this is just a gift that will keep on giving!